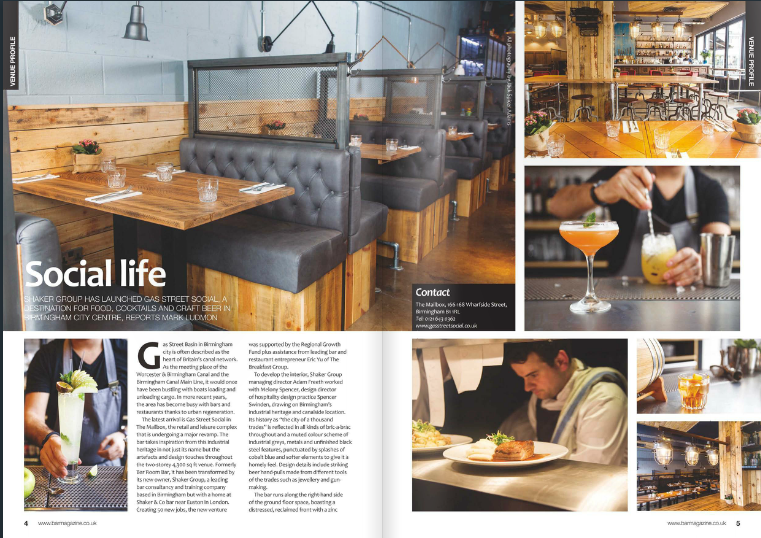 The latest issue of Bar Magazine is out now – with its main feature spread given over to yet more exposure for Birmingham’s top new meeting and eating place Gas Street Social. 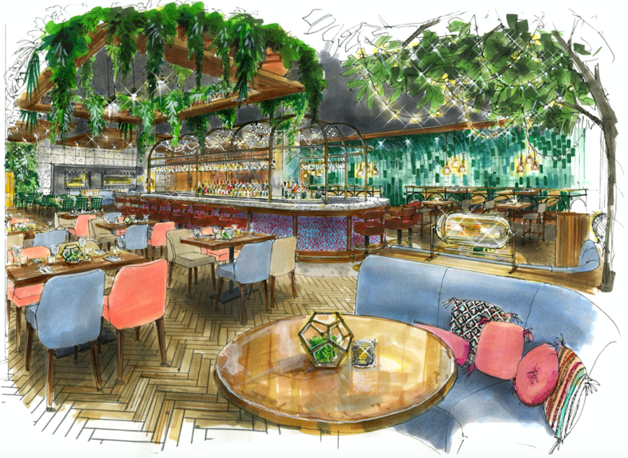 Editor Mark Ludmon has penned three pages on The Mailbox’s latest arrival peppered with 10 stunning images – marking the latest publicity coup for the upmarket bar-restaurant set up by Adam Freeth‘s Shaker Group. That follows whole forests of exposure in the likes of the Birmingham Mail, Birmingham Post, BigHospitality and Midlands Insider, and gigabytes of social media sharing and commentary. But that’s what clients have come to expect when they work with us, because of our stunning design that creates social spaces with crackling soul to draw in their target customers for experiences they crave and want to repeat again and again. That’s our passion – to ‘transform spaces into profitable spaces’ by designing venues that customers love which in turn deliver commercial results for the operator. We do this by starting with the audience that a venue wants to attract, studying their nature and the competition. We then come up with a concept that will inspire customers to come and have a good time, to get people talking and to create loyalty, positive reviews and somewhere to return to. So, as usual, we did lots of research into the demographics of the Gas Street Social area and audience and eyed up the rivals to look for a niche in the market before we designed anything. Then, with Adam, we agreed on a modern bar-restaurant with a nod to Brum’s industrial heritage and rich history using views over the canal network – more extensive than Venice. With the concept confirmed, we could go wild on numerous quirky design details and a plethora of bric a brac artefacts from ‘the city of a thousand trades’. So, guests enter to be assaulted by the dramatic open kitchen with chef’s table and hanging metal unit finished with reeded glass in the centre of the space. A bar runs along the right hand side of the ground floor space and boasts a distressed, reclaimed bar front with a zinc top. Meanwhile the back bar is tiled using scaffolding boards, just one of the venue’s features to boast upcycled materials. We expressed the ‘1000 trades’ theme further through a muted colour scheme of industrial greys, metals and unfinished black steel features, punctuated by splashes of cobalt blue throughout. Impressive hand pulls feature recognisable tools from the trades of Birmingham, such as the jewellery and gun industry, as do (literally) off-the-wall knick-knacks. 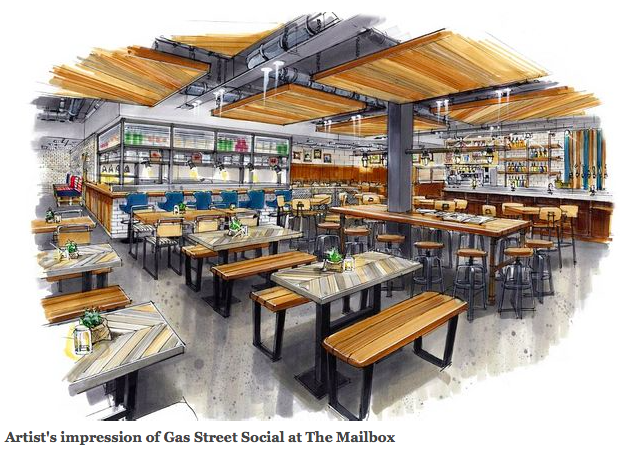 We included varying height booths and seating for 120 diners with plenty of mingling space for those just sharing a few drinks to make Gas Street Social a vibrant venue that people enjoy. 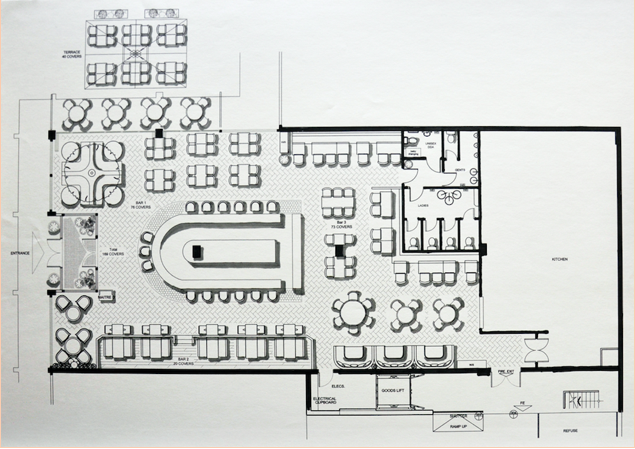 In addition, a large sharing communal table straddles a pre-existing structural column in the venue next to a grab-and-go coffee area. It has all combined to create pre-launch hype and expectation, matched by bookings aplenty and rave reviews since, with customers sharing their ecstatic experiences virally. All in all, the perfect recipe for a profitable new venue – which is all that we ever want to hear we’ve helped to create! You don’t buy a dog then bark yourself. I should know as I’ve got two big ones and you’ll never catch me barking! So I love it when a new client hires us, then genuinely listens to and adopts our thinking and opinions on how to transform their space into a profitable place. And it’s doubly satisfying when the client already has a wealth of experience in bars, casinos and venues from London to Johannesburg via Dubai and big plans to roll their new concept out across the UK. That’s how it’s been from day one with husband and wife team Adam and Theresa Marie Freeth of Shaker Group and their new restaurant and bar in Birmingham’s luxury retail and leisure destination, The Mailbox. And that’s how Pomp & Ceremony with all its quirky British eccentricity became Gas Street Social, an upmarket bar-restaurant inspired by Birmingham’s cultural and industrial heritage that will launch to an expectant audience next month. But I’m getting ahead of myself in the excitement, now that build has finally begun, heralding the final phase of the £750,000 transformation of the 4300 square foot former Bar Room Bar venue. Adam first contacted us on a recommendation from a colleague and we met to develop the concept. We became involved last March and did a lot of research into the demographics of the area before we ever thought about design. That’s how we work because it’s got to be all about the customer and creating an experience that inspires them. That’s the approach that’s transformed the fortunes of many a venue we’ve worked with over the past seven years. So we develop a complete ‘venue metamorphosis’ incorporating not just a unique and intelligent design concept, but an entire new brand and customer experience based on location, demographics, history and image. We then work with the customer to put together a finished brief and overview from both a commercial and customer’s perspective taking into account budget constraints. Only then do we create unique and intelligent designs that turn a venue into a commercially focused work of art that customers want to be a part of. We then work with the client through detailed design and drawings, build and fit-out to ensure the initial brand vision is actually delivered. And even on into aftercare and consultancy on staff selection and training, food and beverage quality and menus, marketing, finance and back office systems. And so that’s how it’s been with Adam since day one. I don’t want to give too much away with launch still a few weeks off but let’s say that the design is true to the visual. Word is already getting out via social media and the traditional grapevine and this is how the Birmingham Post reported it late last month. That was when work began on site with main contractors Approved Shopfitting and Interiors after a full strip out of the entire two-storey venue, including all of the walls and staircases! We’ve designed everything very open plan to give maximum views over the canal and the dramatic open kitchen so you can see your food being prepared. We’ve gone for cobalt blue highlight in the venue against a muted colour scheme of industrial greys, metals and unfinished black steel features. There’s loads of quirky interior detail that we’ve had a ball assembling, including a distressed reclaimed bar front with a zinc top running along the right hand side of the ground floor. We’ve also added hand pulls made from recognisable tools from the trades of Birmingham; such as the jewellery and gun industry. But that’s all I’m going to give you for now. You’ll just have to check in for the next instalment of this blog and progress on the fit-out – and book now for the restaurant from 5pm on Thursday 19th March onwards. On a recent trip to Vegas we took it on ourselves to visit as many casinos as possible to witness firsthand how easy it was to get lost in them, become disorientated and lose money. There is an interesting dynamic at work in Vegas, with quite clearly defined locations for different types of customers. The old part of Vegas, (think rat pack and the mob), has clearly been left behind in terms of investment, as newer, more swanky venues have been built to the South in the more affluent part of Vegas. The old town did feel more alive however, and vibrant, with many street concerts, street acts and outside bars. The old town is clearly a young persons, lads/girls holiday destination and appears to have clearly found a niche. The new town was more, “Broadway”, with stage shows, big name acts and a vast number of expensive features e.g. 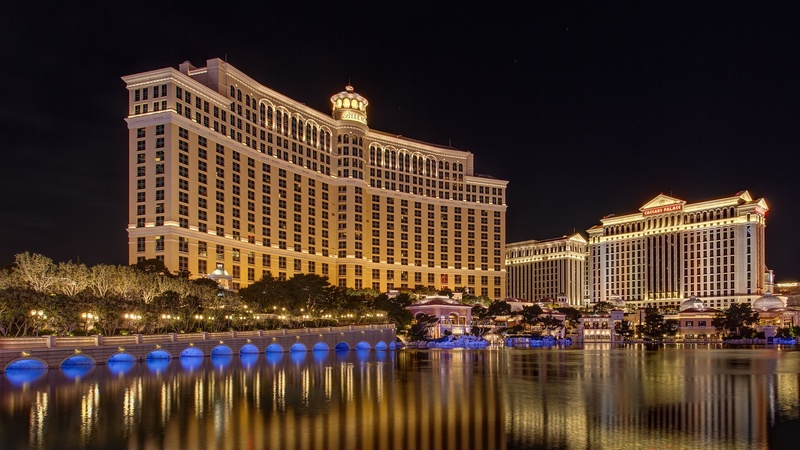 the Bellagio fountains; (the old town does have a single expensive feature: an overhead led street cover over the old strip, though we think this detracts from the feel of the old town in a desperate attempt to attract custom). Casinos design, in the constant search for the leisure $, has clearly evolved over time, as have customers expectations and tastes. This is clearly seen by the gulf in design between older casinos like Bally’s and the newer Bellagio. One offers an inside only swathe of lights, machines and green felt; the other, a complete holiday resort with shops, buffets and pools. Clearly the newer casino designs and their holding companies, only invest millions with clear direction and understanding of public psychology. It is obvious that the understanding of people, their behaviour and wants is far better understood now than it was in the past, on a grand scale. When investing substantially in bricks and mortar it is vital that focus be placed on understanding your market and its people. Can you afford not to invest in understanding your customers before investing in building a venue for them? 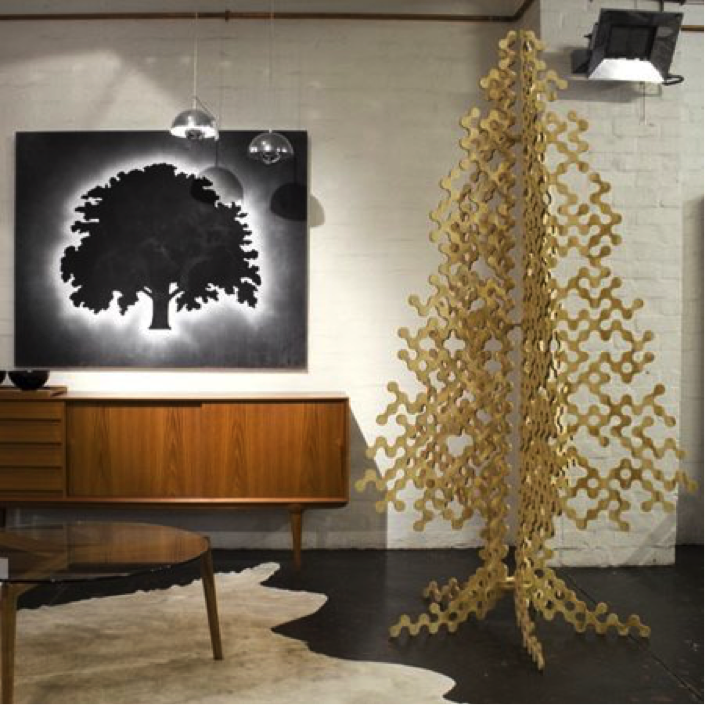 Australian graphic designers Buro North claim their plywood Christmas tree is “80% more environmentally friendly” than a traditional fir or spruce. Available in three sizes, the flat-packed tree can be used year after year. Buro North state their ‘Green’ christmas tree is 80% more environmentally friendly as it is made with environmentally aware ingredients, that are CNC routered (a low-energy production technique) with waste material minimised by design. The designers boast that the flat-packed tree is emissions-efficient to transport and can be used for many a Christmas to come. We agree that in place of plastic artificial trees this is a great improvement environmentally, but how can a plywood tree be better for the environment that a spruce or fir that adds to the environment when composted and recycled? They even did a life cycle assessment report. We’re not sure this is the future of sustainable living but we love the design! Does your offer say “we care”? Welcome to Nanny’s in Shieldaig The experience started with a drive to the middle of nowhere, pulling over for a break and BOOM: everything adds up. Here is a coffee shop that immediately shows it and its owner care. Nanny’s does not care because it has to, Nanny’s cares because it wants to. Nanny’s wants you to have the perfect coffee experience. Nanny’s has a great menu that shows that you, the customer, are all important. It’s all in the detail (as is design). A real bug bear of ours are menus with no veggie options. This doesn’t mean we think everyone should not eat meat (some of our team do and some don’t). You are not going to upset meat eaters with v’s in your menu, you are going to please vegetarians with v’s, BUT you are going to show everyone that you care, (take a leaf out of Nanny’s book, “world famous”, Eilean Donan Castle… that’s another blog but it’s not for now). To further back up the customer experience at Nanny’s there is branding, (tastefully done), an intimate interior and perfect outdoor furniture, in keeping with the offer and surroundings. Nanny’s show the market has been thought about. Nanny says, “we care about you, our customers”. The produce being sold at Nanny’s is fresh and its all good quality. Perfect for making you want to treat yourself, feel special, enjoy the company and the surroundings, (very picturesque surroundings at that!). As professionals we visit lots of coffee shops, and drink lots of coffee, but this was different. Because here is a coffee shop that is not competing against all and sundry, chains, pubs, restaurants, etc, for your coffee £ and yet it takes time to select and serve quality coffee, uses the right furniture, has the right welcome, presents the right ambiance; all because Nanny’s care about you, they care about how you feel, and they care about the experience you have. We spend hours instilling these values into projects. We at Spencer Swinden do this to maximise the returns of venues and here is Nanny’s, in the tiniest of hamlets, at the top of a winding tiny road and they have got it right. Does your offer really say, “we care?”. Get in touch: 0121 551 9897. The Customer experience starts well before they enter your venue. Be distinctive in your brand and communication and allow your audience to understand clearly and simply what you stand for and howtheycan benefitfrom your offer. 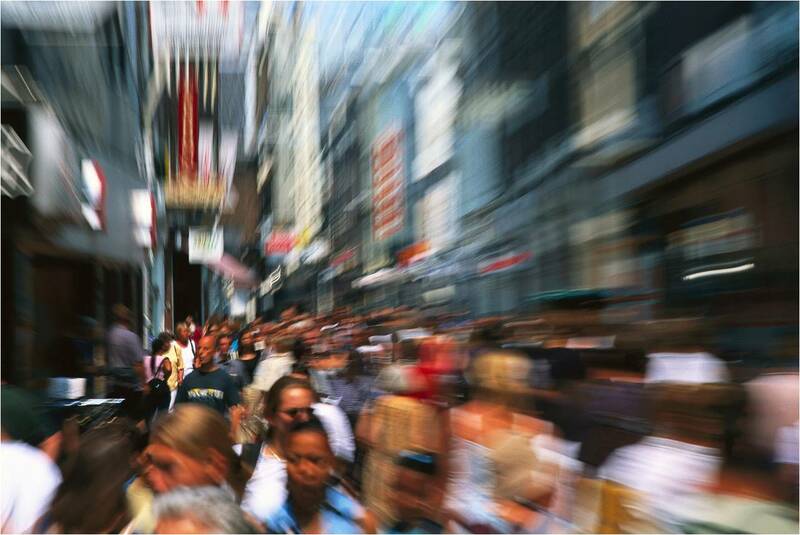 Brand and message confusion can cause uncertainty which often deters visitors. First impressions count so it is vital that you make your premises as attractive as possible. 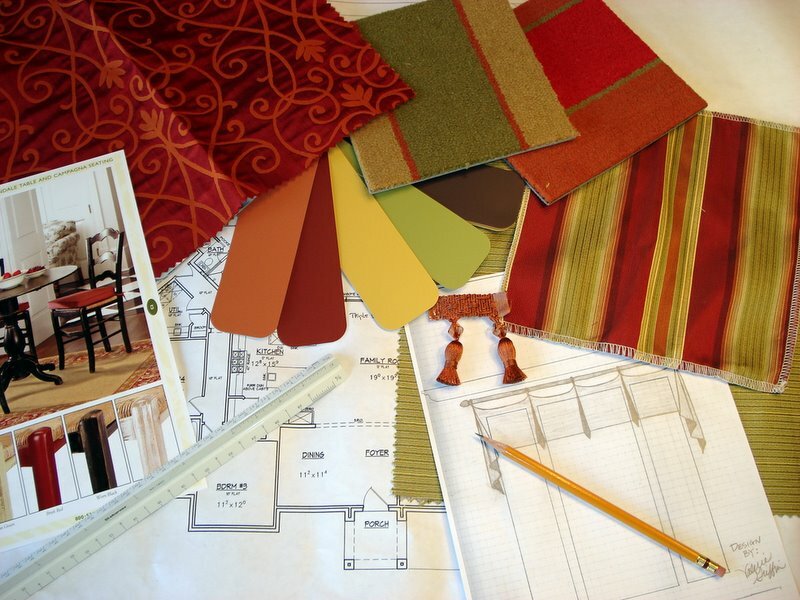 If you cannot afford a complete revamp, there are still small changes that will make a difference. Clear branding/ signage will communicate well with passing trade and details like planting and clean pathways will aid access and draw in custom. Small things, like leaving the front door open can help to make you seem more approachable, and encourage customers to enter. Make sure that you are entirely happy with the products or services on offer. If you are unsure, consider making a visit to a competitor to see what they are offering. You should also make sure that any displays/offers are in keeping with the season. Ensure that seasonal items are removed as soon as they are no longer relevant. If you have a Christmas display up in February, there is something wrong. Is your interior working for your venue? Simple changes to layout and circulation, point of sale, or even the type of seating can completely reinvigorate a venue and increase the longevity of a visit or the number of bums in seats. Many retailers presume that they are limited by the four walls of their venues, but there is nothing to stop you heading out onto the street in search of customers. Think about offering samples or examples to passers-by. Meeting customers on the street can be a great way of enticing them to your venue and building brand awareness at the same time. Despite the increased use of social media over the last few years, retailers are often still hesitant to branch out into the virtual world. Social Media sites such as Twitter and Facebook allow your venues to get involved in the social media revolution and show customers that you’re interested in building a relationship with them. No other medium allows a business to stay that close and engaged with their customers. It builds brand loyalty, keeps the consumer informed about your business, and encourages positive word of mouth. People’s lives are busy and complicated. They need reminding. A lot. Collect email addresses by offering a monthly prize draw and use their contact information to expand your mailing list. A monthly newsletter of upcoming events and offers will keep your customers involved in your business and help spread the word. Repeat customers are the foundation of any successful business, so you should consider ways that you can encourage customer loyalty. It is possible to increase repeat business by offering discounts or incentives to returning customers. Schemes of this sort are particularly useful for businesses that have direct competitors in the area, as they help to differentiate your firm. Consider diversifying your services or offer. For example, if you have a space that’s always empty, sell it as a meeting venue or function room. Offer a take-away or delivery service to busy workers in nearby offices. There are numerous avenues to explore. Your staff are the face of your company as far as the customer is concerned; everything they say or do contributes to the overall image your customer has of your business. Staff training or re-training is imperative. They should be aware of the company brand and direction, know how to deal with complaints and understand the importance of ‘the customer is always right’ philosophy. The local demographics of an area can change rapidly over a very short period of time. For example, the ‘young professionals’ you were originally appealing to have now married and there’s been a baby boom. There is no where suitable for busy mothers on the daily school run to stop for morning coffee or lunch with friends. You may be missing out on a lot of business because you’re aiming at the wrong market. Spencer Swinden Design combines creative flair with commercial awareness, positively transforming spaces into profitable places. Our service primarily is to increase the profitability and awareness of a venue through design. We achieve this by using demographical, competitive & business analysis to allow us to design everything about a venue be it a bar, restaurants or hotel. Why not give us a call and see what we can do you?